We had just wrapped up the "first look" and now were starting to get some creative shots of the bride and groom together. 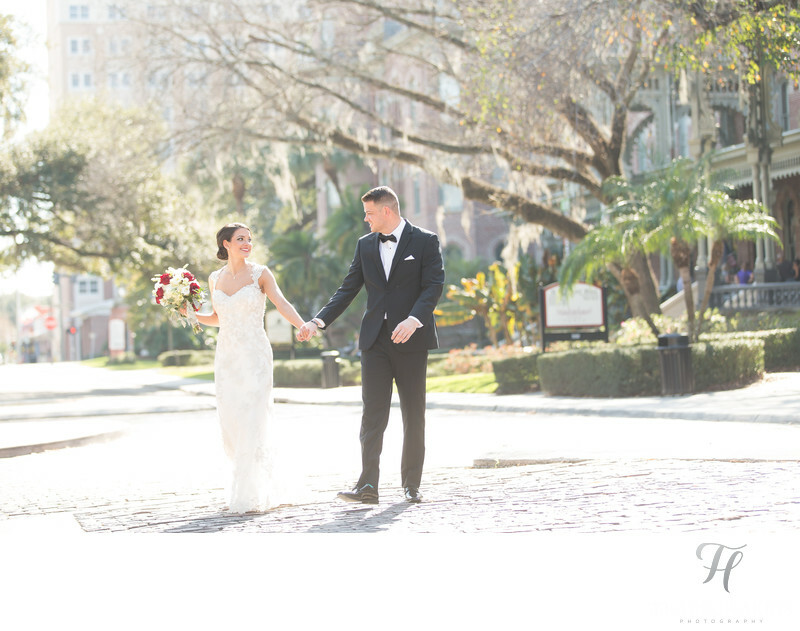 In this Tampa University Wedding photo you can see they look very natural, and "in the moment". In fact, they are not. LOL. I had told them to cross the street on my command, and I then yelled back to them to look at one another, and to "laugh it up". This was the result. It only took about 5 seconds to do, and admittedly looks amazing. Wedding photographers have to work hard at getting the most from their clients, it is no easy task on any level. Let's take a quick look at some of the technical aspects that went in to making this wedding photo. First, this was lit with all ambient light. (meaning I did not use any flash). It was a bright, harsh sunny day (which I actually love), and I simply found an open area where they could walk freely, AND the sun would be BEHIND them. That was key. Then, I just adjusted the exposure value in the camera to suite what I wanted and I was set! It was very straight forward, and offered a nice addition to their wedding album for sure. You can see more from this wedding over here on my blog. If you want to learn more about Tampa University you can check them out over here. Location: 401 W. Kennedy Blvd. Tampa, FL 33606-.